The 5* Vila Sol Golf Resort is an ideal location for golfers, families and holidaymakers alike. For golfers there are 27 holes on the resort which has twice hosted the Portuguese Open in 1992 and 1993 and is the venue for the annual Sir Bobby Robson Celebrity Golf Classic. For golfers looking for variety the 5 courses of Vilamoura are only 5 minutes drive away. For families there are 3 swimming pools and extensive green areas for children to play in. There is also a water park less than a mile away. For adults looking for a relaxing break there are 4 restaurants and 2 bars spread over the 150 hectares. I was born in 1970, I'm married to Sue and we have 2 children. We love the Algarve and bought our apartment in 2008. The apartment was bought primarily as an investment, not a holiday home but having such a wonderful apartment, in the sun and in such a lovely location we find ourselves visiting much more often than we ever intended. We hope you will enjoy your time in our apartment as much as we do. Our children were born in 2001 and 2004 and love coming here. The central pool and gardens area is a great area for the kids and as it is members only, access is very secure so it is a really safe place for the children to play. The reason we chose this area is mainly because it was well known to us. We had been to Vilamoura on several occasions on family holidays and I have been on several golfing holidays. As a family man and a golfer I don't think I could have found a better location. It's so handy to the airport. Just 20 minutes from Faro airport and there are at least 20 great golf courses within a 30 minute drive. En-suite to bedroom 1 with bath with shower, wc, bidet and wash basin. Bathroom with walk in shower, wc, bidet and 2 wash basins. The apartment has air conditioning units in both bedrooms and in the living room. The air conditioning units can be used to heat the apartment as well as cooling the apartment. All beds will have fresh bed linen on arrival. For stays of longer than one week fresh bed linen will be provided in the middle of your stay. Additional replacement can be arranged for a charge. Bosch Washing machine available for use. Bosch Tumble Dryer available for use. There is ample parking right outside the apartment. As a guest of a Village Gardens Club Member there is free Wi-Fi available at the pool bar. The Username and Password will be provided to you before you arrive. Most coffee shops/bars also have Wi-Fi. Fresh Bath towels will be provided on arrival. For stays of longer than one week fresh towels will be provided in the middle of your stay. Additional replacements can be arranged for a charge. Very spacious living area with large L shaped sofa, coffee table, TV, DVD, Midi Hi-Fi, open fireplace and dining table with 4 chairs. Patio doors open out onto large terrace overlooking pools and large landscaped gardens. More than enough for 4 people but if you do feel there isn't/wasn't enough please let us know so that we can get this fixed. Fully fitted kitchen with oven, hob, fridge/freezer, dishwasher, microwave, toaster and kettle. The apartment has BBC1, BBC2, ITV and Channel 4 as well as a selection of SKY Channels (Sports, Movies and SKY1) There are also a few Freeview channels. There is a selection of books in the apartment but if nothing there takes your fancy you can obtain books from Customer Services which is directly opposite Oscars Bar. There is a games room in the hotel which has a Table Tennis Table, Air Hockey, Table Football and a small selection of Arcade Machines. We have a few board games in the apartment. We have left a selection of DVD's in the apartment. These are mainly children's films. The apartment is owned by a member of the Village Gardens Club and as such you will have access to the Central Garden area. Very good sized balcony with Table and 4 Chairs as well as two sun loungers. The apartment is owned by a member of the Village Gardens Club and as such you will have access to the Central Area which has three pools, the main central pool being serviced by a bar in high season. Cleaning / Towels / Linen / Maid service: Bedlinen provided. Maid service weekly. Extra maid service can be arranged for a small charge. No major issues, a few minor niggles. Some blinds were missing from the verticals so not making the property private from the street. Some large cracks in the glass, although not an issue, it was unsightly. The apartment was just a bit tired. But overall, it had everything we needed and these minor points did not detract from our holiday. Absolutely brilliant holiday. The apartment was perfect. It had everything you could possibly need. The photos are exactly like the apartment so no hidden surprises The balcony gets the afternoon sun which is great for chilling out and kicking back with a glass of wine and chatting or reading. The ensuite bathroom was great as the children had their own shower room which worked brilliantly. Hot water always so no cold showers. The kitchen was fully serviceable, plenty of space and in the utility room a washing machine and a tumble dryer which was great for drying our beach towels we brought after the beach or pool. The management company on arrival for keys were brilliant. Showed me how everything worked and were very helpful too. I messaged the owner whilst away to confirm a restaurant he had recommended and he replied quickly confirming the details. I would have no hesitation in recommending anyone stay here, you will love it and I’m definitely returning here for another wonderful holiday with my children next year. Thank you Neil and family for sharing your wonderful Portugal home with us. We will definitely be booking again. Lovely resort & lovely apartment. 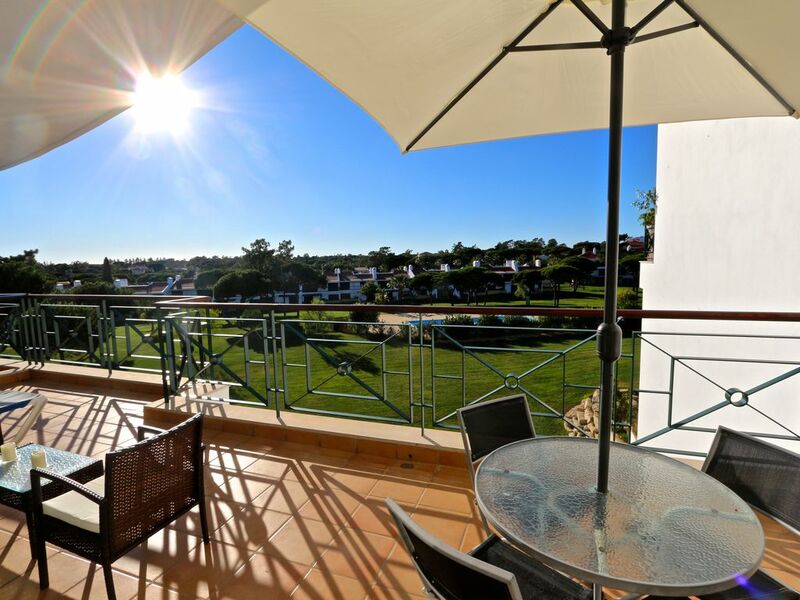 Clean, spacious apartment with large balcony set in a beautiful resort close to Vilamoura, Vale Do Lobo & Quinta Do Lago. The apartment is very nice excellent location Oscars bar just a short walk away. the complex has 3 pools and one is heated . Plenty of sunbeds for use. the apartment itself was presented well , kitchen well equipped , terrace great size. The bed in the master bedroom was a hard bed which was a bit to hard for me . Having said that all in all it was a good rental property for the money . sunny position and you get the sun all afternoon into the evening perfect for sun bathing and Al fresco eating !!!! So glad you enjoyed your stay in our place Gayna. Property was perfect with everything we needed as was described. Vilamoura has two lovely beaches just 2 miles away, 1 either side of the Marina. Both are very well looked after and have beach bars/restaurants available. Quarteria also has a beach with a long promenade with many places to eat and drink. Faro airport is just a 20 minute drive away. Car hire is not essential but advisable. Vilamoura marina with bars, restaurants, shops and casino is about 2 miles away. This apartment is owned by a member of Village Gardens Club, which grants our guests free access to the central area of pools and gardens. Please be aware that this area is now privately owned and not all Vila Sol Village apartments grant you access to the pools and gardens. In case of doubt, please check with the Village Gardens Club administration (vilamoura@ldc.pt) before you rent. Changeover Day: Changeover day flexible. Arrival time after 3pm and departure time 10am. Please check availability of late departure/early arrival.